More info posted on our group site on Facebook folks. Breaking news right now. Two nuclear safety commissions in Japan confirmed there is a meltdown taking place right now. How serious it is will depend on how firm the structure still is that's containing the aria. Fuel rods are melting. This means there could be a huge mass of molten nuclear mess dumping into the water and then venting steam of highly radioactive material. Venting has been shut down at present in a hope to thwart the travel of radioactive material. 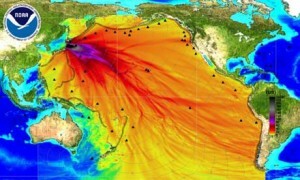 Western States should be on alert right now for radioactive impact within 36 hours. My heart and prayers go out to the people in Japan. My oldest son served a mission in Tokyo. When I visited Japan, the people were the highlight of the trip - they were so kind and just delightful. I tuned in to Wednesday night's self reliance revolution broadcast and was sorry you were ill. Hope you're feeling better! (I also hope you'll come back to the subject another time). "DISCLAIMER: Australian Radiation Services is aware of information about radioactive contamination being spread from the Japanese nuclear reactor incident released under the ARS logo and name. We wish to be clear that this information has not originated from ARS and as such distance ourselves from any such misinformation." here is the ARS website so you can see this disclaimer for yourself. Wayne, I found that out as well, however, on the FB group page I posted another article which shows the jetstream http://modernsurvivalblog.com/nuclear/west-coast-usa-danger-if-japan-nuc... and discusses the impact. I also looked up on the internet "maps of jetstreams" and was able to see plenty of jetstreams which do flow from Japan to the west. But it's still not concrete. Then again, I don't prepare for certainty, I prepare for anything and everything I can possibly think of--Although I too think that the radiation amount hitting the U.S. under worst case scenario with only ONE of the sites melting down to be a bit extreme. However, if there is more than one, then there will indeed be a synergy, making the danger worse than Chernobyl. Kalene, This particular jet stream pattern map is bogus. Collapsenet had it posted early on and removed it after checking out what they thought was a trusted source with apology and amazement that anyone would do such a thing. Which one are you referring to? there should be two maps showing there. One is the "bogus one" and the other is correct. Also, I updated with a correct map on the Face book page. There is no meltdown taking place. Doesn't mean that it couldn't, but stop spreading false information. Don't get as bad as our media with hype, please. Jason, you must be new here. I NEVER post something like this unless I am comfortable with my info. It's because I have a reputation of not doing knee-jerk yellow journalism that people actually put some stock into what I share. This was written directly as I was hearing it during an interview early, early this morning with a nuclear physicist in Japan. TWO nuclear safety commissioners for JAPAN confirmed there is indeed a meltdown happening at one of the reactors. However, they will hopefully contain the venting so that the particles coming our way would not be harmful. First and foremost our concern is for the people of Japan and our prayers go out to them. This is yet another reason to prepare. I have ample supplies for my family of KIO3 tablets for such an event. I suggest that fellow preppers consider the same in case of some type of terrorist attack here. Where do you purchase these tablets? Hooray! I have been looking up information on this very topic. Trouble is, I'm having a lot of trouble finding it in Ontario. We have no LDS canneries, it isn't at Costco and what I have found in the grocery store is actually pricier per mixed gallon than the "fresh" milk. Any suggestions? The news spoke of the use of iodine tablets. I'm trying to do some research on it. Maybe you can help? Possibly iodine is something we should have on hand? I really enjoy reading your articles. Yes, it should definitely be on everyone's check-list. It fills up your thyroid essentially so that any radioactive material can't. However, it's important to note that whichever form you use, you need to be very clear on the instructions of how to use it for your size/age. Also, contrary to myths, there are actually several instances in history in which iodine was used regularly on folks for extended periods of time without dangerous side-effects. That's not to say you want to make a habit of it--just when it's absolutely necessary. Okay, this is not the same type of Iodine (Iodoral iodine/potassium iodide supplement) that my doctor has me take for my thyroid disease, is it??? Isn't the iodine you take for fallout a different form of iodine? Potassium Iodate (Ki03), 170mg, 60 Tablet Bottle If you have a food storage/prep/survival store nearby it may be found there. Or online. This http://www.majorsurplus.com/Search.aspx is one place I found. This is a good time to ask you. Do you know where to get that iodine stuff that is important in situations like this. I knew at one time but have forgotten what it was called or even where to get it. TOKYO (Nikkei)--The Nuclear and Industrial Safety Agency (NISA) said Saturday afternoon the explosion at the Fukushima No. 1 nuclear plant could only have been caused by a meltdown of the reactor core. Also, for info on the iodine tablets, check out this website: http://www.ki4u.com VERY good info! Thanks for posting this. I was looking for some sort of reputable update and checked your site, KNOWING, I can trust any updates here. I'll be checking back. The CDC has some pretty comprehensive info as does the NRC. Is all Iodine created equal, meaning is it all the same no matter where I buy it, or would REAL salt work since I've heard that has a lot of Iodine in it? Just let me know, wondering where to purchase it? Thanks Kellene...I'm so glad someone is doing the research and looking out for us! the amount of iodine in salt is not enough to do the job. You have to take the tablets or liquid. There is also another way if you don't have the tablets, and that is using betadine on your stomach. You can look up the info online and you will also find info at the CDC under terrorism about iodine. The iodine fills up your thyroid so that it cannot absorb the radioactive iodine. That's how it protects you. Ok folks. Let's calm down. First of all, it's not Iodine. It's potassium Iodide or Iodate. Should you have it on hand, yes. And you would want to take it in anticipation of exposure--about 36 hours prior to. However, I'm watching this carefully and while I'm not convinced we're being told everything, I am not to the point yet where I feel taking it is necessary here in the Western States. By the way, a great preventative for this that's healthy is kicking your liver cleanse protocol into double-time. Just FYI. Question: If the fallout takes 10+ days to reach the middle of the US, will it have decayed enough for those people not to have to worry about radiation sickness? Does potassium iodide work for ALL types of radiation? if not, how would we know what kind of radiation we n eed to be worried about? and if not, how do we prepare for other types? Those who live east of the Rocky Mountains have a distinct advantage of protection even in a worst case scenario. Potassium iodide does work for all types of radiation because radiation is radiation just like water is water. There are actually several simple radioactive detection kits you can purchase affordably online, and several sets of instructions on how to make your own. What is that advantage, and why does it exist? I read somewhere that Cesium radiation isn't affected by potassium iodide...I don't know if that's true or not. Potassium iodide only works for radiation from radioactive iodide. It works by filling up the thyroids and therefore the radioactive iodide can not enter into the thyroid. Uh Jason, basic anatomy here. We only have one thyroid. Also, I've never heard of "radioactive iodide." I'm presuming in your zeal for attempting to stand out as the lone "sensible voice" perhaps your typing skills were a bit off. There's iodiNe, potassium iodiDe and potassium iodATE. IodiNe can be stable or radioactive. Enough stable iodine (hard to do) or potassium iodiDe or potassium iodate will flood the thyroid and stop radioactive iodiNe from accumulating. It doesn't stop cesium from accumulating in the body though but that's not the type of radiation that we would expect as fall out from these particular nuclear reactors where America is concerned. And by the way, on your subsequent comment--a meltdown and the explosions are two completely separate issues. While they are related they are not the same thing. A meltdown will NOT necessarily cause an explosion. The explosions were caused by hydrogen hitting heated oxygen. A meltdown is not produce any explosion per se. A meltdown can simply be irradiation of the soil or water when it overcomes its containment. I realize that this is a complicated topic here and I don't share information lightly. Kellene was wondering about the potassium iodide as well for a different reason....is this something that we need in our storage and what kind of a shelf life are we talking about ? I would think tyhis would be important! Now as to why I really wanted to email you....as you knoiw I live waaaaaay out of town,so grocery shopping for me is not very often....however still want to buy your CD on couponing....will get in touch with Vicky about that..(I guess) however I would love to find a few good coupon sites ( a lot of them I have tried...I cannot download....so rather than waste my time thought I would ask you.....plkease some suggestions....thanks a million...PS....Strange how something really bad happens...all of the doubters that you have tried to teach are now interested....Hmmmm. Razr, a bazillion websites are listed in the Enough and to Spare Coupon Training Bootcamp course. You'll have PLENTY of resources, Dear. I don't know why, but my comment s stuck in "awaiting moderation"
That's weird Kim, because if your comment is awaiting moderation it means that you either have posted something suspect of spam, or you're a first time commenter. And you wouldn't have been able to post this comment if either of those scenarios were applicable. Prayers to the people of Japan and everyone out West. Hoping for the best, but preparing for the worst! Yep, something is flagging it. Just wanted to tell people I'd searched and several of the main preparedness sites were out of stock on the iosat tablets, but Anbex, the manufacturer, had it for a reasonable price ($10) plus $4 shipping. Just FYI, it was the links. Anytime links are put into a comment, it goes into the moderation que--and believe me, you all are grateful for it. You won't believe the kind of garbage that tries to come in. Even the URLs are vulgar and reprehensible. Kellene, Do you know how much damage 750 RADs can do? It looks like the RAD go from 3000 (red) 1500 (orange) and 750 RADS for the western US. Does that cause a lot of damage? Does it effect the water supply? Will it effect spring plant of gardens? Will it be in the soil? I'm trying to remain calm, but that map is sure scary. We have 10 days to prepare - when should we take the potassium iodide pills if we can find them - prior to it reaching the US, and for how long? Any help is always appreciated. Thanks! 750 RADs (or Radiation Absorbed Dose) is a significant amount. most often it would result in death if it was absorbed all at once. Having said this, there is NO WAY to predict how much radiation we would receive in the USA unless we know how much contaminated material is released into the atmosphere. The #1 reactor is only 460 MW which is the smallest reactor they have at this facility and compared to other reactors in the world is still on the small side. (US Aircraft carriers have larger reactors.) The amount of radioactive material released would never exceed the total amount of material available in the reactor, thus the maximum would be 76 million Curies, dispersed over about 6 billion acres of ocean (and who knows how many cubic feet of air) in the north pacific, consider prevailing winds and the fallout that would occur over the ocean and the chance of any significant radioactive material dropping on the USA is slim. For a reference, radiation reduces as an inverse square with distance from the source, so if they contain the material there will be no measurable radiation in the USA. In fact, 76 million curies would only measure 76 REM/hr at 1 kilometer, much smaller than the 750 RAD you are concerned about. The earthquake and Tsunami are both going to take longer to recover from than this reactor plant problem. My prayers are with the people of Japan. Even 300 RADS will impact the soil, water, etc. If there is indeed a total meltdown like Chernobyl, then you would want to take the Iodide immediately. However, getting accurate information is what I'm concerned about at present because Japan is heavily leveraged in foreign currency. If there is too much "gloom and doom" published about them, then it will compromise the value of their own currency, which will cause a ripple effect of them selling what they believe to be their least valued currency (US debt), in an effort to bring in more stable currency to clean up everything. This would flood the U.S. market and subsequently tank our currency value to the point that not even a talking head or a bogus Wall Street rally could cover it up. Seems like a lot of questions about Potassium Iodine, let me try to sum it up for you. Potassium Iodine does only ONE thing, it saturates the thyroid gland with normal Iodine (I-127) so the thyroid will not absorb radioactive Iodide (I-129). This will potentially protect your thyroid from succumbing to thyroid cancer. Iodine pills do not protect you from radiation exposure, nor do they prevent you from becoming contaminated by radioactive particles. Radioactive particles released from nuclear fission are across the entire range of know elements, with the majority of fission product yield being in the 85-95 and 130-140 atomic number range. So really, having Potassium Iodine pills is one of those things that is a "nice to have" if you are concerned about thyroid cancer, but I would not consider it a priority in a radiological incident. Wayne is correct. The thyroid is where the particles will normally collect, but if the thyroid is full, then it will be discharged from your body. However, this is not used simply to prevent thyroid cancer. Cancer is a fungus in it's simplest form. This is about strategically protecting the rest of the body from the poisoning by eliminating the central part where the radioactive particulates will enter the body. Also, just to reiterate, you can use iodine--long way to go about it though. You're better off using the potassium Iodide and Iodate. Finding the tablets is super-duper easy and they have don't have an expiration date that's found to be legitimate so far. So Kellene is there anywhere in particular you suggest buying potassium Iodide and Iodate from? Or anything particular we should be aware of when we do buy it? Alicia, there are lots of links that folks have posted in this comment section for where to buy the tablets. But my go-to spot would actually be Amazon (I get free shipping as a Prime member) and they are aggressive on pricing for just about everything they carry. So if I can't get it easily right where I live and with a coupon :-) then that's where I go. April, I'm sorry. I don't have any expertise in that respect. I would simply have my fingers do some searching on the net for information or if you've got any of the military survival methods for nuclear events, it will be covered in there. Hi, I live in Ukraine , and study the effects of Nuclear power, i am an American expat, and I served 11 years in the USA Army Chemical-Bio-Nuke as my MOS and job, I also visited, and know every aspect of the Chernobyl incident. This 2nd core reactor just exploded. These reactors are similar to Chernobyl, but have better protection. They have 2 containers. The outer just blew. The inner is made of metal and is very thick. think of it like tank armor. The elements of the inner nuclear rods, must be cooled, or they will heat up to such a degree they will melt the steel. They are so hot they melt the steel even at a hotter rate then when the steel was made and formed. To melt the steel it will take about 12 hours, if not properly cooled..but most likely the steel will crack open exposing the rods, and sending then ex teem lethal amounts of radiation in the air, after this the rods must be covered with sand, metal casing and must be confined ,or the will emanate radiation for 1,000 years. With the reports of the USA navy reporting 1 months radiation levels in 1 hour. I am convinced the core has melted. I think the Japs are more worried about the economy, and are doing just like the Soviets and covering this up. That facility went 10 hours without being cooled..and thus the rods melted the steel casing. I am near sure Japan is in a full scale nuclear meltdown. Also read that Sodium Alginate MAY absorb radioactive substances in the body and move them out. Worth having on hand (also can contain Iodine). Just google Sodium Alginate. I have piles of diatomaceous earth. Does that have iodine in it? I've also read that kelp, Redmond clay and miso soup are good for a fall-out situation. I have found that most places are wiped out of any type of iodine supplement save kelp. I agree with Cy I spent 4 yrs in the US Navy and then 10 yrs in the Naval Shipyard doing nuclear and refueling work...they are not telling the whole story..glad I'm not over there..I doubt a lot of those stupid reporters would be nosing around if they knew much either..when you see people in nuke suits thats a clue...you don't see the important nuke people over there directing things..they are doing it from afar..there has never been an accident that involved several nuke plants..thats one for yhe history books I'm sure..I keep tablets but there are a lot of other dangerous things you can get from radiation besides thyroid cancer..look up info for yourself..I don't think we need to worry much here from Japan but this is a good lesson for the future if something should happen here..a nuke attack..just remember the important things are time..distance ..and sheilding... look these up under nuclear info so you know how to protect yourself and your family..I feel sorry for the Japanese..I quit the work because I was worried about my exposure and the things they don't even know yet about what it will do to you and future generations. I have seen peple retire with cancers that are unexplained..when you have to bury a hot peice of nuclear waste the size of a deck of cards in a 55 gallon drum full of cement and ship it off in the middle of the night on a train to some town that people don't know it is there ...something is wrong..just my two cents...P.S. just heard that they are pulling the Navy ships back away from the area because some of the sailors came back hot with radiation..does that tell you something? I know that a lot of people writing on here seem to be very upset as we all are about Japan and especially all the Nuclaer plant happenings. A lot of people seem to be kind of paniced about getting PK tablets or iodine..that is nice to have in your preparedness kit but I don't think alot of people are aware that unless you are in the nuclear plant or near it during an incident(because of the sheilding) or at ground zero for a nuclear attack that you can survive..maybe you could find an expert that could talk on your radio show about it and explain to people how they can prepare the best way for a nuclear attack or a nuclear incident if they live by a plant..I hope I have not paniced anyone by what I wrote about it..I didn't mean to but unless you have done that kind of work you don't know about it usually..since the cold war is over they don't drill on it at all..maybe they should.. I have a 21 year old daughter serving on the USS Mustin. I keep hearing about the Japanese people and their fears of radiation, but I'm not hearing too much about the Navy ships off the coast, including the USS Mustin. I'm sure they've given our sailors potassium iodine, but is that enough? If so, does anyone know how it works, physiologically? Any insight would be greatly appreciated. Just hoping everyone is aware that the image posted DOES NOT represent readiation, fallout, or anything nuclear related in any way. It represents energy released by the quake, and the diffucion of this energy through the pacific. Let's learn all we can while keeping the prayers coming.